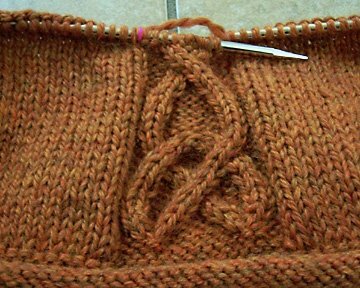 Then using dpns, I knit the cable portion back up, following the chart. 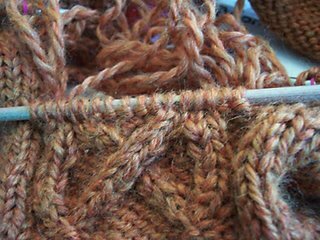 After a little smoothing and pulling the stitches into place, it looked great! The wrong was righted. Woo! The first picture shows the color of the sweater more accurately. I was using Elann's Peruvian Highland wool in chunky weight (I think it is discontinued now) and it knit up to a perfect aran gauge for me. See? I instigated blog fodder. Aren't I helpful? 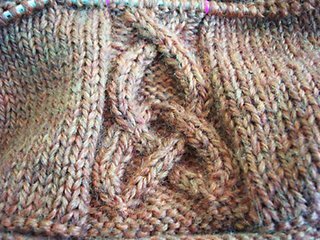 I did figure out that increase yesterday, and yes, it's still incorrect in the pattern. I gave you blog fodder. Aren't I helpful? I figured out that increase yesterday, but it is still incorrect in the pattern. I recently took my mentee in hand and walked her through ripping down and reknitting cables. Now she thinks I'm magic. :-) Nice pics of the process! I'm bookmarking it for future lessons. And, yes, you are a naughty blogger for leaving us hanging for so long. And you can count on us to poke you when you're quiet too long. Hey Rosemary -- I just bought that pattern yesterday. Now I just have to dif thru the stash. Did you have trouble printing the pattern? It locked up my computer at page 13 and then I had a bit of a mess. But all is well now. I know you have been a busy, busy person. Will try calling you tomorrow (Monday). Nice surgery on Rogue. It's looking very yummy. thanks for the comment, i am not sure what is with my blog, it looks fine to me! i think you may have just inspired me to get cracking on my own rogue. if i ever get home that is.